As a reference resource for future biochemical and genetic analyses, we used genome-wide tiling arrays to establish the transcriptomes of mouse limb buds at three different stages, during which major developmental events take place. We compare the three time-points and discuss some aspects of these datasets, for instance related to transcriptome dynamics or to the potential association between active genes and the distribution of intergenic transcriptional activity. These datasets provide a valuable resource, either for research projects involving gene expression and regulation in developing mouse limbs, or as examples of tissue-specific, genome-wide transcriptional activities. Limb development has fascinated biologists for a century, mostly because of the importance of these structures in the evolution of land vertebrates and due to their spectacular morphological diversity. From an experimental viewpoint, limbs are quite easily accessible at various stages of their ontogenesis and can thus be manipulated, to some extent. Genetically speaking, limb phenotypes can be easily detected and usually do not impair survival too strongly. For all these reasons, limbs have been excellent model structures to study vertebrate patterning and morphogenesis. Tetrapods limbs bud out from the lateral plate mesoderm and establish early on the bases of a three-dimensional pattern. The growth along the proximo-distal axis largely depends on FGFs signaling emanating from the apical ectodermal ridge (AER) and acting over the mesenchyme. On the other hand, the anterior to posterior (AP) axis is specified essentially by Hand2, the Shh pathway and posterior Hoxd genes. Amongst the known regulators of the dorso-ventral (DV) patterning are Wnt7a, expressed in dorsal ectoderm, and Engrailed, in ventral ectoderm, as well as Lmxb1, a gene transcribed in dorsal mesenchyme. These signaling cascades act together in a highly coordinated manner [1–3]. At later stages of development, e.g. starting from E11.5 onwards in mice, mesenchymal condensations form and establish the future skeletal pattern, following a tightly regulated process. The first elements to appear are those of the future stylopod (humerus, femur), then of the zeugopod (radius, ulna, tibia, fibula) and, finally, the autopod (hands and feet). This period of limb development, referred to as 'proliferative expansion, determination and differentiation' , is a very dynamic phase, where differences amongst tetrapods start to be translated from the genetics (the transcription, maintenance and silencing of regulatory genes and their readouts) to species-specific morphologies. Such differences in the shapes of tetrapod limbs, may rely upon slight variations in these 'genetic' parameters, such as transcriptional heterochronies or quantitative effects of key developmental molecules [4–6]. While many of those genes critical for limb development were described over the past 15 years, additional players, such as regulatory RNAs, have come into play more recently. There is indeed increasing evidence that long non-coding RNAs (ncRNAs) may be crucial for some developmental processes  due to their involvement in various functions including gene regulation, both at the transcriptional and post-transcriptional levels, in the organization of epigenetic modifications  as well as during gene activation and silencing . Surprisingly, inter-species sequence conservation does not seem to be essential , even in the cases of the Xist, Air or Evf-2 RNAs where important functions were demonstrated [11–13]. The best-studied long ncRNAs are associated with imprinted gene clusters, where many of them act by repressing neighboring genes via a cis-effect [13, 14]. As a resource for research projects involving gene expression and regulation in developing mouse limbs, we set up to produce and analyze whole genome expression data for E11.5, E13.5 and E15.5 forelimbs. We selected these three stages of embryonic limb development not only because these days are very dynamic, in terms of growth and organogenesis, but also because the transcriptional activation of several known genes occurs during this time-period, giving us both an idea of the relevance of the datasets, and the possibility to look at the vicinities of these loci to evaluate a potential clustering of transcriptional activities. Within this time-window indeed, the muscular and skeletal systems develop in parallel with massive vascularization, innervations and skin formation, implying large amounts of new cell types and tissue interactions. We selected three different ontogenetic stages to see how global transcriptional activity evolves along with development of a complex structure, not only by considering protein coding genes, but also intergenic transcription and non-coding RNA expression. We sampled mouse embryonic forelimbs at days 11.5, 13.5 and 15.5 postcoïtum, by cutting off the entire forelimb buds from the body wall (Figure 1A). The particular morphogenetic events occurring at these stages have been largely described earlier (e.g. ). Briefly, E11.5 limb buds consist of a rather poorly differentiated inner mesenchyme, located within an epidermal envelope. Despite this apparent uniformity, mesenchymal cells at this stage can be already differentiated as belonging to denser, centrally located regions where condensation of the future cartilage rods starts to occur . These condensations appear with a time sequence that follows a proximal to distal progression. At the same stage, the first nerve fascicles become apparent, originating from the brachial plexus. Experimental setup and tiling array intensity distributions. A: Schematics of embryos at the three stages of limb development (E11.5, E13.5 and E15.5) considered in this study. Forelimbs are indicated with a color code that is used in subsequent figures. The bars below the embryos indicate relative size differences. B: Histogram showing the intensity distributions along chromosome 2 for intergenic, intronic and exonic transcription. Exons considered are as defined in UCSC Known Genes annotation. C: Distribution of probe intensity around expressed genes on chromosome 2. TSS: transcription start site; PAS: polyadenylation site. Vertical gray dotted line: determined threshold level (in this example log2 = 7.554). By day 13.5, the cartilage primordia of the future limb skeleton are already well defined, the digits start to separate from one another as a result of inter-digital cell death. There is massive deposition of muscle elements (already initiating in late E11.5 buds), nerves extend into the hand plates and few hair buds are already apparent. The limbs are fully vascularised and the skin starts to stratify. Embryonic forelimbs at day 15.5 have completely separated digits. The ossification process, which starts around E14.0, is in progress even in the most distal phalanges. Most of the tendons are now well defined and there is strong progression of skin stratification. Following RNA extraction and processing (see materials and methods) labelled cDNAs were hybridized onto whole genome tiling arrays (Affymetrix, Genechip Mouse Tiling 1.1R). After data normalization (see materials and methods) we used the UCSC Known Gene annotation system (mm9, 2007) to quantify expression levels in exons, introns and intergenic regions. Intensity thresholds to determine expressed transcripts and genes were calculated for each array, as exemplified by using chromosome 2 (Figure 1B). Distributions showed low intensities both in introns and intergenic regions, with introns showing slightly higher signals possibly reflecting precursor mRNAs or splice forms not covered by our annotation. In contrast the distributions for exons were clearly shifted towards higher expression. We also observed a bias in intensity around annotated transcripts since the signals in regions downstream of the annotated transcript ends were usually more pronounced and decayed more slowly than in regions upstream of the transcription start sites (TSSs). Also, in several cases, the 3' untranslated regions (UTR) were much longer than anticipated from the UCSC Known Gene annotation (Figure 1C). Overall, we observed that transcription was mostly confined to the vicinity of annotated genes, a finding that is consistent with RNA-seq studies in mouse and human , though some novel transcription sites were found (see below). The global expression data for individualized exons, transcripts and genes at the three developmental stages are shown in Table 1 (panel A). 41.17%, 42.69 and 44.25% of known genes were expressed in forelimbs at E11.5, E13.5 and E15.5, respectively. Based on UCSC gene models, about 90% of these were annotated as coding genes (we incorporated 'near-coding genes' into this category). 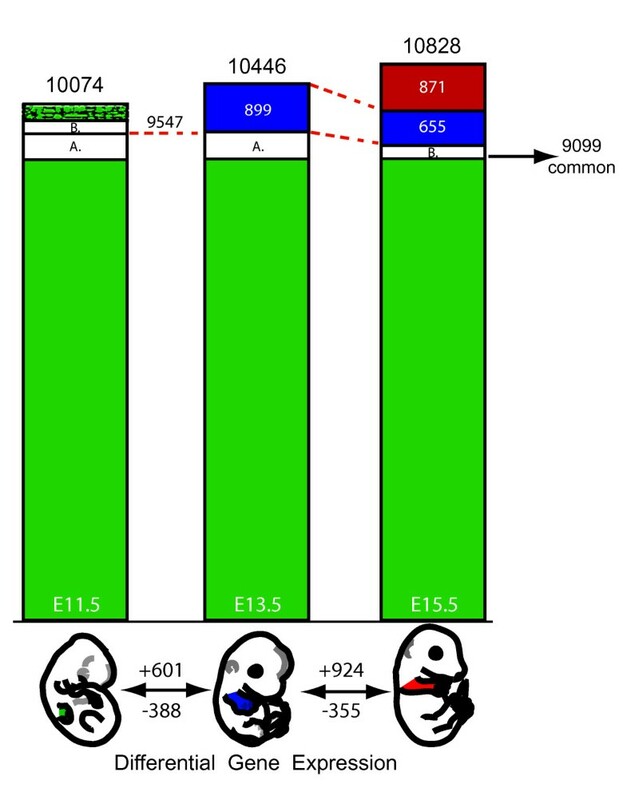 Interestingly about 95% of all expressed genes were common to the three developmental stages, with an average increase of 4% between E11.5 towards E15.5 limbs (Figure 2). A: UCSC Known Gene expression and gene model categories. B: Intronic transcription. Numbers in parentheses shows those intronic transcripts for which the genes containing them were also expressed. C: Transcription of intergenic regions and sub-categories (see Materials and Methods). The 'unexplained' category represents transcribed intergenic regions remaining after filtering (cf. Methods). Gene expression dynamics during three stages of limb development. Top: The expressed UCSC Known Genes at the three limb developmental stages. Smooth green areas represent genes expressed at all three stages (n = 9099). Blue areas show genes whose transcription is gained at E13.5 (n = 899) and still found expressed in embryos at E15.5 (n = 655). The red area represents genes that are significantly expressed only at E15.5 (n = 871). The patterned green area in E11.5 highlights those genes that are expressed only at E11.5 (n = 297). The white areas indicate genes that are expressed in both E11.5 and E13.5 limbs, but not at E15.5 (A; n = 475), or with genes expressed in both E11.5 and E15.5 (B; n = 203), yet not in E13.5 limbs. 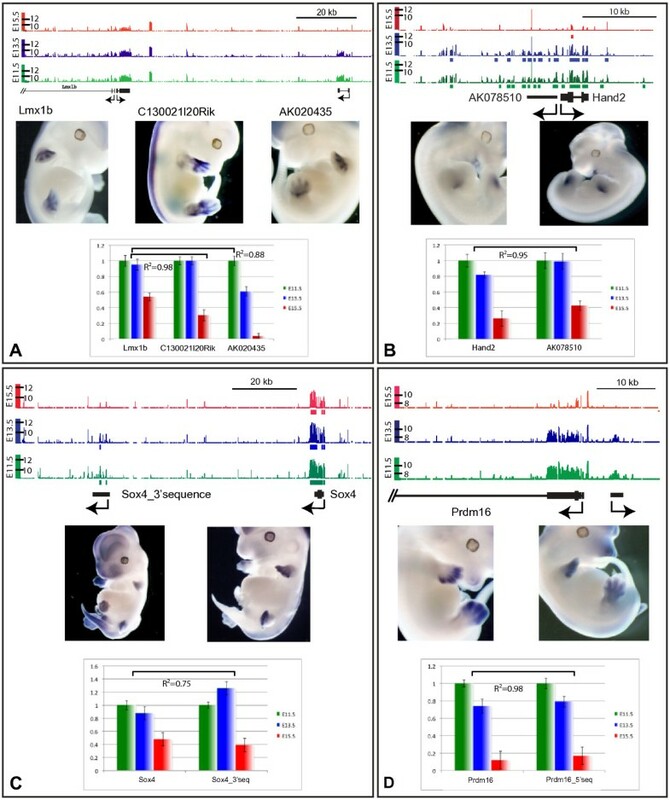 Bottom: Differential gene expression in forelimbs between the developmental stages. The numbers of up- and down-regulated genes are indicated above and below the arrows, respectively. We compared the expressed genes between the three developmental stages to evaluate which percentage was significantly changed along with limb development (see Methods). Between E11.5 and E13.5, we identified 601 up-regulated genes and 388 down-regulated genes (Figure 2, Additional file 1). Between E13.5 and E15.5 forelimbs, 924 genes were found up-regulated and 355 down-regulated. While these figures indicate that the general tendency goes towards an increase in the number of genes expressed, along with developmental time, they should be considered carefully since they derive from comparisons between steady-state levels of RNAs. Consequently, they do not necessarily reflect transcriptional switches and may point to RNAs whose transcription has increased, in the case of a gene considered as 'newly expressed'. Likewise, RNA stability may prevent, in some cases, the timely detection of a particular transcriptional switch-off. In addition, the cellular topographies of gene expression patterns are usually not homogenous and hence variations in relative transcript abundance may also indicate variations in space rather than in time (see below). We looked into these parameters by quantitative PCRs on some of the genes, for which changes in expression patterns had been previously reported (Additional file 2). In addition, six genes with either known or unknown expression profiles, were validated by in situ hybridization (Additional file 2). As examples, the Cbln1 mRNA, essential during synapse formation  yet with previously unknown profile, was weakly expressed at E11.5 only, whereas the Tmem8c gene was specifically expressed in early muscle elements along both the trunk and the limb and progressively increased its expression throughout development. To evaluate whether differentially expressed genes could be grouped into particular functional categories, we used the Ingenuity Knowledge Base http://www.ingenuity.com. This analysis indicated that functional categories such as muscle and skeletal system development, or skin development were enriched, as expected from the developmental stages under scrutiny (Table 2). We also performed a more detailed gene ontology analyses using GOMiner , to see if development related terms were enriched in our sets of differentially expressed genes. Functions were clustered into hierarchical trees (see Additional files 3 and 4) and the results showed that terms related to muscle development again dominated, both when E11.5 limbs were compared with E13.5, and when E13.5 limbs were compared with E15.5. This is most likely due to high number of genes encoding muscle structural proteins. Cartilage, bone, and cell-adhesion related term enrichments were also scored. Noteworthy, the number of functional clusters was higher between E13.5 and E15.5 than between the two younger stages, which reflects an increased tissue diversification along with the processing of limb development. We matched our sets of differentially expressed genes with the mammalian phenotype database http://www.informatics.jax.org and scored 69 genes that had been previously associated with abnormal or short limb morphology (Additional file 5). *Fisher's exact tests were used to calculate p-values. Although we applied a rather stringent threshold, we observed extensive intronic transcription, since about 50 percent of expressed genes also contained signals (≥300 bp) covering intronic sequences (Table 1B). While, in some instances, this can be explained by introns retained after splicing, the majority of this intronic activity seems to derive either from alternative start sites, as suggested by looking at some profiles of histone post-translational modification tracks from various cell types in the UCSC Genome Browser [19, 20], or from alternative transcription termination, which seems to occur frequently in human or mouse genes and can thus lead to intronic transcription . In addition, about 30 percent of these intronic signals were detected within genes that are not expressed during limb development, indicating the presence of independent transcription units overlapping with known genes. We also scored 7408, 7471 and 7477 transcribed regions above threshold (≥300 bp), at E11.5, E13.5 and E15.5, respectively, within intergenic regions (Table 1C). We further filtered this raw data using the Ensembl database for possible overlaps and approximately 25 percent of these sequences were thus identified. Half of these matched protein coding genes, whereas the other half was composed of pseudogenes and retrotransposed elements (Additional file 6). Protein coding genes showed 48 percent parity with UCSC coding genes which, due to different annotation of 3'UTR sequences, and hence because of their different lengths, had not been identified earlier. After this filtering, 4312, 4399 and 4354 intergenic regions remained clearly transcribed during the three developmental stages, respectively (hereafter termed the 'unexplained' category). Some of these regions may reflect alternative start sites, extended 3'UTRs, retrotransposed or pseudogene elements, as well as non-coding RNAs. We next asked whether these transcribed intergenic regions were distributed randomly throughout the genome or, alternatively, whether they would tend to be associated with (or be located at the vicinity of-) active (or silent) gene loci. We thus analyzed the transcriptional status of those genes located around each transcribed intergenic region, to assess whether they were themselves expressed or not (Figure 3). Our genome-wide survey indicates that transcribed 'intergenic regions' are indeed found more frequently at the vicinity of transcribed genes, an observation valid as long as a distance of less than about 50 kb is considered. If a larger distance is allowed, this association becomes less significant (Figure 3A). The same tendency was observed when we estimated the fraction of expressed, or non-expressed genes, with flanking transcribed intergenic regions (Figure 3B-D). There again, a higher fraction of expressed genes, as compared to non-expressed, showed flanking intergenic transcription. In this case, interestingly, this correlation was increased when considering the sub-group of genes coding for transcription factors (Figure 3B,C) and even non-expressed transcription factor-coding genes appeared to be more frequently surrounded by transcribed intergenic regions. Intergenic transcription and proximity to expressed genes. A: All 4312 expressed intergenic regions (orange) at E11.5 were annotated as 'close to' an expressed gene (red), 'close to' a non-expressed (blue), 'not close to' a gene (green). Black lines show the expected borders between blue and green areas if genes were distributed randomly relative to expressed intergenic regions. B: Expressed genes are enriched with nearby intergenic transcription. Fraction of genes (expressed, solid red line N = 8582; or not-expressed, solid blue line N = 14848) with an expressed intergenic region within x bp is plotted over genomic distance (x-axis, log scale). Transcription factors (TF) selected based on Gene Ontology terms (GO:0003700; GO:0006355) (expressed, dashed red line N = 847; not expressed, dashed blue line N = 534) showed higher fractions in both categories when compared to all genes. C: A gene neighborhood was defined as its upstream and downstream regions half-way to the next annotated gene or maximally 50 Kb. The fraction of genes (expressed, red; not-expressed, blue), which contain unexplained intergenic signals within neighborhood is shown. Expressed genes have more of their neighborhoods covered by intergenic signals (top red and blue line). 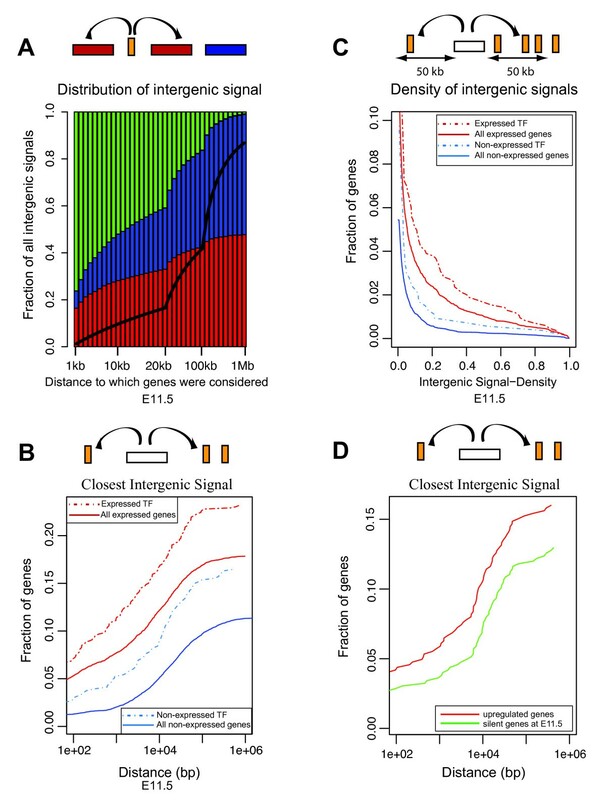 D: Transcription of intergenic sequences increases as nearby gene expression increases. For a selection of genes (N = 525) up-regulated from below threshold at E11.5, to above threshold at E13.5 or E15.5, the fraction with nearby intergenic signals is shown as in B at E11.5 (green) and E15.5 (red). A higher fraction of genes with nearby intergenic transcription is seen at E15.5, as the expression increases. These results may reflect the presence, in the vicinity of annotated genes, of alternatively spliced regions, or alternate start sites, located at a distance, which had not been previously identified. It may also indicate that intergenic transcription may result from the nearby transcription of a 'standard' transcription unit, via a generic by-stander effect. For example, modifications of the epigenetic landscape associated with gene transcription may generate ectopic transcripts in the neighbourhood. In support of this, the fact that this observation is accentuated around transcription factors, i.e. nearby genes that, at least during development, are often controlled by remote regulations, over large distances . We also measured the frequency of intergenic signals around those genes up-regulated between E11.5 and E15.5. However, the number of such genes with associated intergenic signals within a given distance was too low to be fully significant. 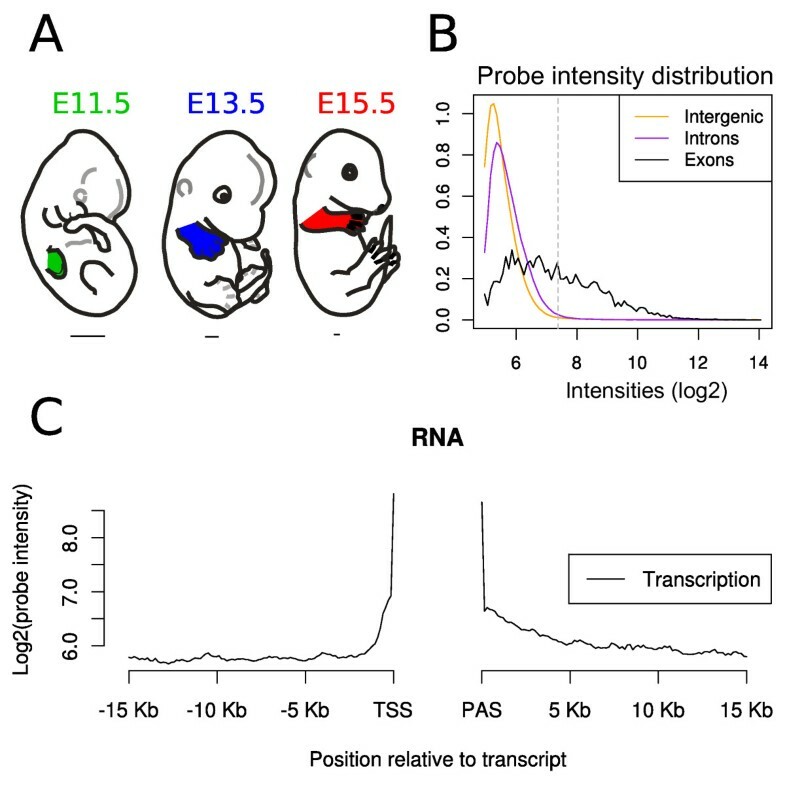 The fact that transcription factor genes scored as 'not-expressed' showed an above-average occurrence of intergenic signal around them raises the possibility that these loci may maintain 'open' local chromosomal domains for subsequent activation, as proposed in the case of embryonic stem (ES) cells based on the existence of a bivalent state in chromatin modifications . We searched for a differential expression of non-coding RNAs (ncRNAs) annotated in UCSC, between the three developmental stages. After careful (manual) curation, which removed all potential 3'UTRs, pseudogenes and non-coding isoforms of coding genes, we identified 49 long ncRNAs that were differentially expressed in our samples (Table 3). Amongst them, ten were typical bidirectional transcripts, one was a cis-antisense transcript, two were antisense in the 3' end of genes (tail-to-tail), whereas the remaining ncRNAs were not closely associated with any gene. Twenty-two ncRNAs increased their relative amounts at steady state levels, between E11.5 and E13.5, whereas eleven of them decreased in amount between E11.5 and E13.5. Between E13.5 and E15.5, eleven ncRNAs were up-regulated and 25 down-regulated. As an example, the ncRNA Neat1 appeared as progressively up-regulated, consistent with the earlier observation that Neat1 expression was re-enforced during muscle cell differentiation . We also assessed the level of conservation of these transcripts (using PhasCons scores) and found that they were globally poorly conserved in sequences amongst vertebrates, in agreement with the idea that the transcription itself of these RNAs or their structure, rather than sequence conservation, may be important [25, 10]. List of differentially expressed long non-coding RNAs, as annotated in UCSC. '1' means that the lincRNA is upregulated between the two stages considered, whereas '-1' indicated a down-regulation. The orientations with respect to the closest coding genes, as indicated, were not related to the distance between them. Conservation scores (PhasCons) indicate mean values, as determined from the alignments of 29 vertebrate genomes with the mouse (downloaded from UCSC). The expression of four long ncRNAs was examined in some details by in situ hybridization (Figure 4), both to validate the transcriptome data and because these ncRNAs are localised at the vicinity of genes known to be relevant for limb development. For instance, the important limb developmental regulator Lmx1b gene is surrounded by several intergenic transcripts, in particular by a well-described bi-directional transcript along its promoter region (; Figure 4A). The hybridization pattern of this ncRNA showed a nearly identical spatial distribution, in dorsal limb mesenchyme, and its expression dynamics closely matched that of Lmx1b. 60 kb upstream of Lmx1b, we found a differentially expressed transcript, which may as well be an alternative start site for this gene since it is transcribed from the same DNA strand and expressed in an identical dorsal mesenchyme domain, even though it was more dramatically down-regulated at E15.5 than Lmx1b, as validated by qPCR. This example illustrates the difficulty to discriminate between genuine ncRNAs and parts of known transcription units located nearby. In situ hybridizations of selected intergenic transcripts. The charts show relative amounts of transcripts as measured by qPCR at E11.5 (green), E13.5 (blue) or E15.5 (red). Expression levels at day E11.5 are normalized to 1. Correlation coefficients (R2) indicate the relative correlations between the expression of both the protein coding genes and the associated intergenic transcripts. Tiling array data (scales in log2 on Y-axes) and genomic maps are also shown. A. Lmx1b gene and associated upstream region, with bidirectional transcripts annotated here as Lmx1b and C130021l20Rik. A potential alternative start site for Lmx1b, 60 kb upstream (AK020435) shows the same expression specificity. B. Bidirectional transcription at the Hand2 locus, with both Hand2 and the AK078510 transcript displaying related patterns in the posterior margin of developing forelimbs. C. An as yet unknown intergenic transcript (BC025054) located 50 kb downstream of the Sox4 locus, on the same strand of chromosome 13, which is expressed like Sox4, suggesting it may be a remote 3' exon of this gene. D: Bidirectional transcription at the Prdm16 locus on chromosome 4, with an as yet unknown transcript mimicking Prdm16 expression in the E12.5 digital plate. Two bidirectional non-coding transcripts were also examined in some details by in situ hybridization, one starting very close from the start site of the Hand2 gene, whereas the other one starts at approximately 5 kb from the Prdm16 TSS (Figure 4B, D). Here again, expression patterns were nearly identical between the ncRNAs and their 'host' genes. Both Hand2 and the associated ncRNA were expressed in a patch on the posterior side of the developing limb bud, whereas the Prdm16 pair was transcribed strongly in distal autopod cells, in particular in growing digits. In both cases, it is thus likely that the transcription of these ncRNAs was achieved by regulatory modules used to control the genes located nearby (or vice-versa). The fourth case selected as an example is at the Sox4 locus. Sox4 is a rather small gene, located on chromosome 13 and surrounded by large gene deserts, which display series of significant transcript signals during limb development. Several such peaks were observed both in 5' of the gene, where they matched small bi-directional transcripts (not shown), and in 3' where up to more than 400 kb large unspliced ncRNAs were scored (annotated). We focused our attention on a peak of transcriptional activity located approximately 50 kb downstream from the Sox4 3' UTR and tested it by in situ hybridization (Figure 4C). Again, the expression pattern was globally that of Sox4, though with some differences, in particular in the developing major body axis. Expression patterns in the limbs were similar to one another, suggesting once more that this ncRNA was under the control of the regulations acting over Sox4. ncRNAs appear to be involved in diverse biological processes, as exemplified by the association of some lncRNAs with gene silencing (e.g. [8, 27]). Our results indicate that these RNA species are frequently coupled either to actively transcribed regions, or to enhancer regions controlling genes of importance for developmental processes [28, 29]. Accordingly, it is often unclear as to whether these transcripts result from a by-stander effect, i.e. by recruiting the activity of potent enhancer sequences located nearby, or if their control sequences evolved partly or entirely due to their own functional outcomes. Gene clusters usually comprise structurally and/or functionally related genes that may have arisen via ancestral gene duplication events. Clustered genes often share some of their regulatory controls, either due to the existence of global regulatory modules controlling several genes at once, or because duplications also included some target sequences for upstream factors. On the other hand, gene duplication events certainly favored some functional divergence. For example, a duplication event generated the Gdf10/Gdf2 pair of transcription factors on chromosome 14; while Gdf10 is differentially expressed in the developing limb (up-regulated from E11.5 toward E13.5), Gdf2 is not expressed there. In contrast, both the Zic2 and Zic5 genes, also produced by a late duplication, are differentially expressed with the same dynamics (down-regulated from E11.5 toward E13.5), whereas the paralogous genes Zic1 and Zic4 were scored as non-expressed. Another case is the Iroquois gene family, with both the Irx3/Irx5 and Irx1/Irx2 pairs scored as being expressed, whereas the distal genes Irx4 and Irx6 were not detected. Interestingly, in the cases of Zic5, Irx2 and Irx5, promoter-associated bi-directional transcripts were also detected (AK011684, AK086211 and AK017076, respectively). Other examples for clustered expression of transcription factors are the Myf5/6 muscle-specific genes , which were up-regulated during differentiation, or the Cbx2/8/4 triplet, where Cbx2 was down-regulated in older limb buds, whereas Cbx8 and Cbx4 were expressed steadily throughout the three stages. The four Hox gene clusters have been used as models for the coordinated regulation of expression in a variety of derivatives, including in developing limbs. In particular, the HoxA and HoxD clusters, which contain 11 and 9 genes, respectively, have essential functions during both hind- and forelimb development . In both gene clusters, we observed transcription profiles in agreement with published datasets, showing a global decrease in intensity in E15.5 limb buds, mostly reflecting the cell type specialization of gene expression and hence a severe dilution effect when compared to the general expression in mesenchymal cells observed in E11.5. Extensive intergenic transcription was scored, whose expression profiles followed those of the surrounding Hox genes (Additional file 7). In the case of HoxD, three such intergenic regions encoded by the same strand as all Hoxd genes were tested by in situ hybridization. They all showed expression patterns virtually identical to those of the closest Hoxd genes, suggesting that they may be expanded 3' UTRs (additional file 7). In the case of Hoxa13, a bi-directional transcript was also scored, yet its expression profile was not related to that of Hoxa13. Recently, this transcript (AK033508) was named HOTTIP and shown to be involved in the regulation of HoxA cluster genes in cultured cells . Finally, the largest gene clusters differentially expressed in developing limbs were associated with the skin developmental programs, including the keratin gene complexes on chromosome 11 and 15, or the Sprrb and S100a genes on chromosome 3, with a dominant expression at E15.5. These latter genes are part of the 'epidermal differentiation complex', spanning nearly 3 Mb and composed of members of different gene families clustered together [33–35]; (data not shown). More than 100 imprinted genes have been reported in the human genome, organized into distinct and large chromosomal regions http://www.har.mrc.ac.uk/research/genomic_imprinting/. Imprinted gene clusters usually involve genes unrelated in structure or function, and in many cases they contain one or more ncRNAs that may regulate gene expression in cis (long ncRNAs) or in trans (miRNAs, C/D small nucleolar RNAs). A well-known example of a complex imprinted gene cluster is the Dlk1-Gtl2 locus on chromosome 12. The whole gene array located on the positive DNA strand seems to be up-regulated in limbs between day 11.5 and 13.5, with the most significant change observed for Gtl2 (Meg3) and the Rian non-coding RNAs (Additional file 7). Dio3, lying at the very 3' end of the complex was silent (not shown). The miRNA cluster, embedded within and in 5' outside the non-coding RNA Mirg, also gave a positive signal, suggesting they may be part of a larger transcript. Amongst the gene members of the cluster, Gtl2 was shown to be important during embryonic development , as deletion of the maternal allele resulted in perinatal lethality and skeletal muscle defects . Other imprinted genes relevant for limb and/or bone development were found expressed, including the Gnas-Nespas locus, important for cartilage development  or Cdkn1c, within the Kcnq1 imprinted cluster , as well as the Igf2-H19 cluster, necessary for skeletal development and ossification [41, 42]. Plagl1 (Zac1), a gene encoding a zinc-finger transcription factor, which regulates other imprinted genes and is also required for bone ossification , was progressively up-regulated, indicating the potential importance of imprinted genes during limb development. These datasets provide a valuable resource, either for research projects involving gene expression and regulation in developing mouse limbs, or as examples of tissue-specific, genome-wide transcriptional activities. More specifically, we found that expression signals are frequently confined to known transcript boundaries but tend to extend past the 3'ends of genes. Also, about 40 percent of known genes were found expressed in limbs of 11.5, 13.5 and 15.5 days old foetuses. We observed extensive intronic transcription, since about 50 percent of expressed genes also contained signals covering intronic sequences. After filtering, more than 4,000 intergenic regions remained clearly transcribed during the three developmental stages. Finally, we identified 49 long ncRNAs that were differentially expressed in our samples. C57Bl/6J embryonic forelimbs at stages 11.5 (20 limbs), 13.5 (8 limbs) and 15.5 (2 limbs) were dissected along the body wall and kept in RNAlater. Total RNA was extracted using RNeasy-mini columns (Qiagen), DNaseI digested on-column, treated with RNase free DNase I once more (Roche), and further processed according to the Affymetrix GeneChip WT Double-Stranded Target Assay manual. Briefly, ribosomal RNAs were depleted and samples were reverse transcribed. These cDNAs served as templates for cRNA synthesis (amplification), which were then reverse transcribed again. The products were fragmented, labeled and hybridized onto Genechip Mouse Tiling 1.1R arrays. The qualities of all initial steps were monitored by Bioanalyzer 2100 (Agilent). All microarray-related experiments were done in duplicate. All experiences involving animals were carried according to the Swiss law, under the authorization number 1008/3482/0 (to DD). The tiling array set consisted of 14 chips. For each of these chips and each of the six samples (3 time-points × 2 duplicates), standard background correction and quantile normalization was performed; mismatch probes were not used. The correlation of probe intensities (log2) on all replicated arrays ranged form 0.84 and 0.91. Probe coordinates were converted to the July 2007 build of the mouse genome using the UCSC liftOver software http://hgdownload.cse.ucsc.edu/admin/exe/. For each chromosome on a chip, a summary procedure was then performed as follows. Known gene annotations were downloaded from UCSC http://genome.ucsc.edu/cgi-bin/hgTables and complemented by miRNA, snRNA and snoRNA annotations from ensemble http://www.ensembl.org. All probes in an exon were considered as a single block. In introns and intergenic regions, blocks were defined using a sliding window of 500 bp width. For each block, a linear model identical to that in the RMA method  was used to estimate the three condition-specific expression levels from the six samples. This regression was done after log transformation of the normalized intensity data. Thresholds for expression of exons were defined by the 99th percentile of the distribution of expression levels in the regions annotated as intergenic. Transcripts with 80% or more expressed exons were considered to be expressed. Genes with 50% or more expressed exons were considered to be expressed. Small RNAs were only considered if they were larger than 100 bp. Differences in expression were calculated by taking the median (log-scale) expression level across the exons of a gene, and then calculating the differences between pairs of experimental conditions. A permutation method was used to define significance thresholds on differential expression: probes were permutated locally along the genome as follows: a random variable drawn from a Gaussian distribution (standard deviation = 1 Mb) for each probe and was added to the probe coordinates. The probes were then ranked according to their new coordinates. In the permutated dataset, the intensity of a probe was then replaced by the intensity of the probe with equal rank in the randomized coordinates. Five permutated datasets were generated and differential expression levels of genes were calculated as above. Expression differences greater than the 99th percentile or smaller than the first percentile of the expression differences in the combined permutated datasets were considered as significant. Intronic signals were defined as continuous regions above threshold of at least 300 bp length and containing no unspotted regions (regions without hybridization probes) of more than 100 bp. Intergenic signals were defined as continuous regions above threshold of at least 300 bp lengths. Once identified, intergenic signals were classified as flanking UCSC annotations if they were within 100 bp of a UCSC known gene annotation. Wherever possible, intergenic signals not classified as flanking UCSC annotations were identified from Ensembl annotation, differentiating between Ensembl overlap, where an overlap of at least 200 bp existed between an intergenic signal and an Ensembl annotation, and Ensembl flanking, where the intergenic signal was within 100 bp of the Ensembl annotation. The remaining signals were considered and termed unexplained. expressed intergenic regions (orange) at E11.5 were annotated as 'close to' an expressed gene (red), 'close to' a non-expressed (blue), 'not close to' a gene (green). For Figure 3, the distance cut-off to assign 'close' varied form 1 Kb to 1 Mb (x-axis) using bin size increasing by 1 Kb from 1 Kb to 20 Kb, by 10 Kb from 20 Kb to 100 Kb and by 100 Kb from 100 Kb to 1 Mb. PhastCons conservation scores  were downloaded from UCSC website using 29 vertebrate genomes alignments with the Mouse (mm9-PhasCons30way). Mean conservation scores were calculated for genomic regions covering the selected ncRNAs. Whole mount in situ hybridizations were performed according to standard protocol. Amplified cDNA products were ligated into pTopo-BluntII (Invitrogen) vector. Digoxigenin (Roche) labeled riboprobes were produced using T7 or Sp6 RNA polymerase (Promega). Hybridizations were carried out overnight at 68°C. Hybridizations were detected using NBT/BCIP solutions (Roche). Real-time qPCRs were done in triplicate with Express Sybr GreenER premix (Invitrogen) using CFX96 Real-Time system (Biorad). Primers are compiled in the supplementary material (Additional file 8). Raw tiling array data (CEL files) as well as .wig files suitable for display in the UCSC genome browser are available at the Gene Expression Omnibus (GEO) under accession number: GSE27417 http://www.ncbi.nlm.nih.gov/geo/query/acc.cgi?acc=GSE27417. We thank the members of the NCCR genomics platform for their help with tiling arrays as well as members of the Duboule laboratories for discussions. This work was supported by funds from the Ecole Polytechnique Fédérale, Lausanne, the University of Geneva, the Swiss National Research Fund, the National Research Center (NCCR) "Frontiers in Genetics", the EU program "Crescendo" and the ERC grant Systems Hox.ch (to D.D.). IG helped design and carried out the experiments and drafted the manuscript, BS analyzed the data, FN supervised data analysis and interpretation and DD designed the experiments and wrote the paper. All authors helped writing the article.